SEC Network - ESPN Press Room U.S. 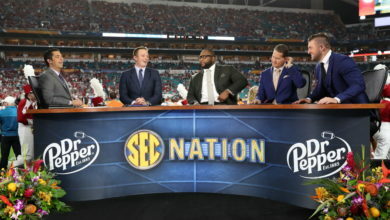 The Southeastern Conference and ESPN have signed a 20-year agreement through 2034 to create and operate a multiplatform network which launched August 14, 2014. The new network and its accompanying digital platform will carry SEC content 24/7 including more than 1,000 events in its first year. The network will televise 45 SEC football games, more than 100 men’s basketball games, 60 women’s basketball games, 75 baseball games, and events from across the SEC’s 21 sports annually. Programming will also include in-depth commentary and analysis in studio shows, daily news and information, original content such as SEC Storied, spring football games, and more. AT&T U-verse® TV, Bright House Networks, Charter, Comcast Xfinity TV, Cox Communications, DIRECTV, DISH, Google Fiber, LUS Fiber, Mediacom, PTC Communications, Suddenlink, Time Warner Cable, Wilkes Telephone, and members of the NCTC, NRTC and NTTC and will carry the television network nationwide at launch. Hundreds of additional live events from various sports will be offered exclusively as SEC Network+ events on WatchESPN and SECNetwork.com through authenticated access from AT&T U-verse, Charter, Comcast, Cox, DIRECTV, DISH, Google Fiber, Suddenlink, and members of the NCTC, NRTC and NTTC.